Contrary to the portrayal in classic Western movies, there is more to our desert than cactus, dirt, and tumbleweeds. Mesa, Arizona is a gateway to the ultimate water recreation paradise consisting of three lakes and two rivers. Go just outside of our city limits and you’ve made it to Tonto National Forest. It’s one of the many places in Arizona where the Sonoran Desert’s iconic Saguaro cactus grow and one of the few places left where the wild horses roam. Tonto is the fifth largest forest in the United States and one of the most-visited "urban" forests in the country. Visitors can enjoy a plethora of water activities while splashing around in Mother Nature’s swimming pools. Ease into your H2O-fueled fun with some lazy tubing down the Lower Salt River. 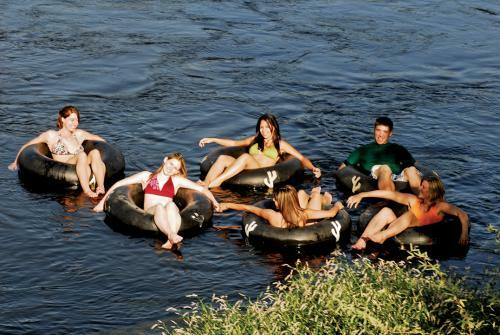 Gather your group and head to Salt River Tubing to rent a tube, catch a shuttle and enjoy Arizona’s floating picnic. You can get dropped off at two different starting points to enjoy a short float or an all-day experience in the cool water. Bring your GoPro and capture the beautiful sites from the riverbed while you kick-back and flow with the current. Keep your eyes peeled as you might even get a visit from the wild horses that roam free along the waters in Tonto National Forest. If you’re looking for more fun on the river but tubing isn’t your style, don’t worry we have something for you too! The Water Recreation options are endless. Rent a kayak or stand-up paddleboard (SUP), and if you don’t have space in your vehicle to haul one you can rent an inflatable paddleboard instead. If you have a big group, there are some options for getting your group and gear to the water provided by the rental shops. If you want to experience an adventure down the river and learn about the surrounding wildlife and environment, then book a guided tour; if you go this route then transportation can be provided for your group and your gear. 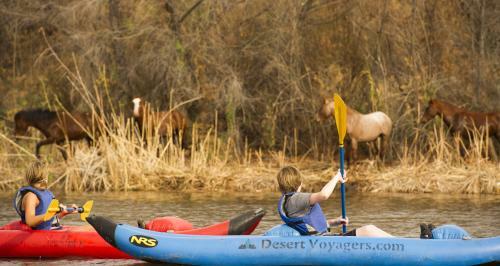 Rafting, kayaking or paddle boarding tours are available along the Salt River and Verde River. Explore our interactive map to see all of the different places for water recreation in Mesa City Limitless®. 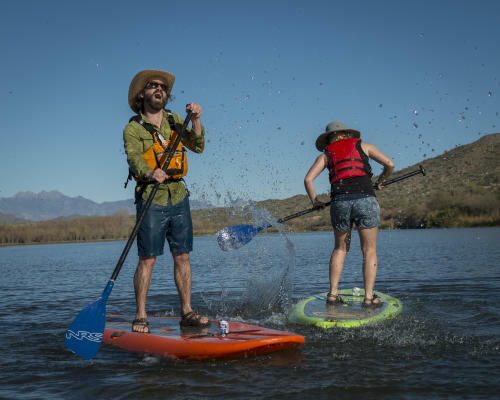 As the Salt River flows from the East to the West it connects three different lakes that offer an oasis for boaters, action water sports, and visitors looking to cool off on the pockets of beach shoreline. Just thirty minutes outside of Mesa, Saguaro Lake is the closest body of water that allows motorized watercraft. Drive a little further and you won’t be disappointed by the towering cliffs and scenic views of Canyon Lake and Apache Lake, which are both along the historic Apache Trail. Bring your rented gear to these lakes or rent some there instead. No boat, no problem. Guests can rent a variety of watercraft ranging from pontoon and fishing boats to personal jet skis and even wakeboarding boats and head out on their own water-filled adventure. At Jet Action Rentals, visitors can rent jet skis already equipped on a trailer ready for towing to open waters. Daily rentals start at $125, and select jet skis can sit up to three people. At Az Power Toys in Mesa, visitors can rent a wakeboarding boat with all the gear necessary to have an adrenaline-pumping day on the lake. Precision Marine, located at both Canyon and Saguaro Lakes, offers hourly and daily rentals of their fishing boats. Apache Lake also has boats you can rent out for an hour or 24 hours. Or if you want to keep it simple, grab a paddle and jump in a canoe, kayak, or on a SUP and row out on the water. Visitors can enjoy Saguaro Lake anytime of the year without having to bring any type of watercraft. Hope aboard the Desert Belle Tour Boat for a narrative cruise and take in the beautiful scenery. To enjoy our beautiful waterways a Tonto Pass, a daily (24-hour) recreation pass, is required. Passes sell for $6.00 per vehicle, and if you plan on towing a motorized watercraft then you will also need to purchase a Watercraft Use Sticker for $4. Passes are available at 200 locations in the Mesa area including nearby convenience stores and, online or by mail. We would love to see your days out on the water with your favorite people! Just tag #VisitMesa or #MesaCityLimitless on your social media posts.